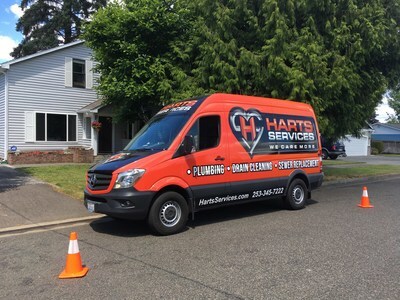 TACOMA, Wash., Feb. 14, 2019 /PRNewswire/ -- Harts Services, a top-rated Tacoma plumbing company with a 4.9 review rating on Google, is providing water conservation to Tacoma homeowners looking to cut back on their water usage in 2019. "There are lots of good reasons someone might want to cut back on their household water consumption," said Richard Hart, co-owner of Harts Services. "People conserve water for financial, environmental and lifestyle reasons or all of the above. Whatever the reason, you can take some simple steps to cut back, even just a little bit." Use native plants in gardens ? Plants native to the area often require less water than non-native plants since they're already adapted to the Puget Sound environment. Recycle water ? Water can often be saved and used for other purposes. For instance, when boiling pasta or eggs, instead of throwing that water down the drain, Hart recommends people use it for watering their garden. Don't wash half loads ? New appliances are continuing to get more efficient, and many these days can detect how many dishes or how much laundry is inside the machine to provide the optimal amount of water without waste. Homeowners with older appliances that don't have these capabilities are advised to fill the dishwasher and washing machine to full capacity whenever possible. Since these older appliances use the same amount of water washing a single item as they do a full load, it's more efficient to fill them all the way. Wash cars at the car wash ? Contrary to what some may believe, washing cars at a commercial car wash can consume less water than washing it at home. Commercial car washes often recycle water used at the beginning of the wash cycle. Additionally, car washes have to follow guidelines on the kinds of soaps they use and how they dispose of wastewater. Homeowners may not realize that washing vehicles at home can pollute their local waterways by carrying harmful chemicals to the storm drain. Storm water does not flow to the sewer and is often carried to local waterways, polluting streams if the storm water is carrying contaminants. "You don't have to make drastic lifestyle changes in order to use and consume less water in your everyday life," Hart said. "These are just a few ways people in Tacoma can make a difference without having to significantly alter your day-to-day routine. If we all do some little things, it can lead to big change."